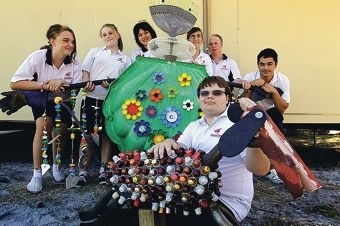 Leeming Education Support Centre students Krystal Davis, Victoria Newark, Leonie Hartanto, Rachel Liddle, Shane Devlin, Zac Sawyer and (front) Nathan Churchill. The Year 8 Leeming students entered the annual Sunflower Scarecrow Competition with their creation made from recycled materials from home, school and the local verge collection. Leeming Senior High School’s Education Support Centre teacher Voin Zivkovic said the scarecrow project had generated huge enthusiasm among the students. ‘This is a great way to recycle and help save our garden plants from crows in our school,’ she said. The competition, which supports local children’s charity Therapy Focus, promises to be a major highlight at Garden Week with 38 scarecrows from across the state on display.